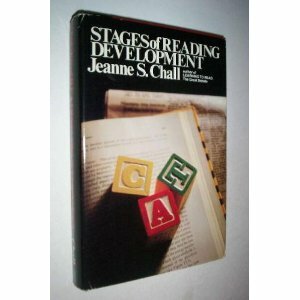 Noted early childhood education theorist Jeanne Chall lays out her stages of reading development. Stage 0. Prereading: Birth to Age 6. The Pre-reading Stage covers a greater period of time and probably covers a greater series of changes than any of the other stages (Bissex, 1980). From birth until the beginning of formal education, children living in a literate culture with an alphabetic writing system accumulate a fund of knowledge about letters, words, and books. The children grow in their control over various aspects of language—syntax and words. And they gain some insights into the nature of words: that some sound the same at their ends or beginnings (rhyme and alliteration), that they can be broken into parts, and that the parts can be put together (synthesized, blended) to form whole words. Stage 1. Initial Reading, or Decoding, Stage: Grades 1-2, Ages 6-7. The essential aspect of Stage 1 is learning the arbitrary set of letters and associating these with the corresponding parts of spoken words. In this stage, children and adults interiorize cognitive knowledge about reading, such as what the letters are for, how to know that bun is not bug, and how to know when a mistake is made. This stage has been referred to pejoratively as a “guessing and memory game,” or as “grunting and groaning,” “mumbling and bumbling,” or “barking at print,” depending on whether the prevailing methodology for beginning reading instruction is a sight or a phonic approach. The qualitative change that occurs at the end of this stage is the insight gained about the nature of the spelling system of the particular alphabetic language used. Stage 2. Confirmation, Fluency, Ungluing from Print: Grades 2-3, Ages 7-8.6. Essentially, reading in Stage 2 consolidates what was learned in Stage 1. Reading stories previously heard increases fluency. Stage 2 reading is not for gaining new information, but for confirming what is already known to the reader. Because the content of what is read is basically familiar, the reader can concentrate attention on the printed words, usually the most common, high-frequency words. And with the basic decoding skills and insights interiorized in Stage 1, the reader can take advantage of what is said in the story and book, matching it to his or her knowledge and language. Although some additional, more complex phonic elements and generalizations are learned during Stage 2 and even later, it appears that what most children learn in Stage 2 is to use their decoding language, and the redundancies of the stories read. They gain courage and skill in using context and thus gain fluency and speed. Stage 3. Reading for Learning the New: A First Step. When readers enter Stage 3, they start on the long course of reading to “learn the new”—new knowledge, information, thoughts and experiences. Because their background (world) knowledge, vocabulary, and cognitive abilities are still limited at this stage, the first steps of Stage 3 reading are usually best developed with materials and purposes that are clear, within one viewpoint, and limited in technical complexities. This is in contrast to Stage 4 where multiplicity of views, complexity of language and ideas, as well as subtleties of interpretation are the expected. Stage 4. Multiple Viewpoints: High School, Ages 14—18. The essential characteristic of reading in Stage 4 is that it involves dealing with more than one point of view. For example, in contrast to an elementary school textbook on American history, which presupposes Stage 3 reading, the textbook at the high-school level requires dealing with a variety of viewpoints. Compared to the textbooks in the lower grades, the increased weight and length of high-school texts no doubt can be accounted for by greater depth of treatment and greater variety in points of view. Stage 4 reading may essentially involve an ability to deal with layers of facts and concepts added on to those acquired earlier. These other viewpoints can be acquired, however, because the necessary knowledge was learned earlier. Without the basic knowledge acquired in Stage 3, reading materials with multiple viewpoints would be difficult. Stage 5. Construction and Reconstruction—A World View: College, Age 18 and Above. When Stage 5 is reached, one has learned to read certain books and articles in the degree of detail and completeness that one needs for one’s purpose, starting at the end, the middle, or the beginning. A reader at Stage 5 knows what not to read, as well as what to read. To reach this stage is to be able to use selectively the printed material in those areas of knowledge central to one’s concern. Whether all people can reach Stage 5 reading, even at the end of four years of college, is open to study.